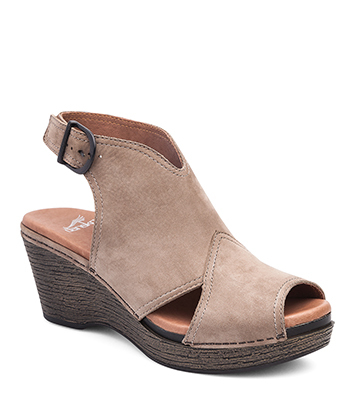 The Dansko Taupe Milled Nubuck from the Vanda collection. Casual and contemporary, the lightweight peep toe Vanda slingback bootie offers a gentle fit on a stylish and stable textured wedge heel. A cushioned footbed supplies comfort and support, while the hook-and-loop ankle strap offers adjustability.